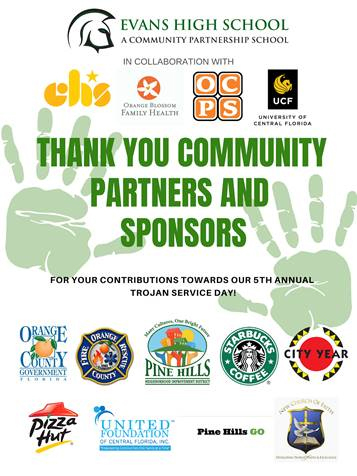 Our 5th Annual Trojan Service Day took place on March 30, 2019, at Evans High School from 7:30 a.m. to 12 p.m.
About 500 students and volunteers arrived to help with the beautification of Evans campus, the Boys & Girls Club and Rolling Hills Elementary, as well as with cleaning the streets of portions of District 2 and 6. The day began with volunteers checking in and helping themselves to breakfast sponsored by Starbucks. After breakfast, everyone was ushered into the gym for the opening ceremony. There, Mr. Rolando Bailey (Evans High School Principal), Mr. Michael Shaver (President & CEO, Children’s Home Society of Florida), Commissioner Christine Moore (District 2), Commissioner Victoria P. Siplin (District 6), and Mr. Craig Schneider (Director of Operations for Starbucks and Board Chair for City Year Orlando) gave inspirational and motivating messages to get the day started. 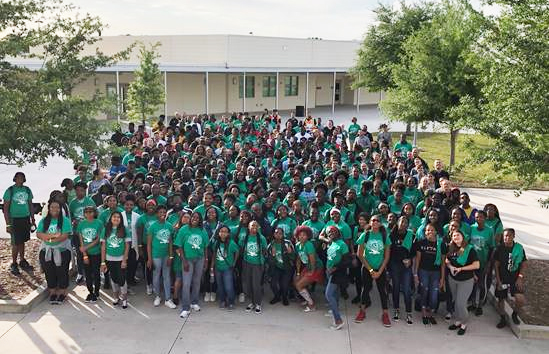 Along with the service opportunities, there were also learning opportunities that were beneficial not only to Evans students but to all who participated. Orange County Fire & Rescue conducted a professional development session that gave students insight into their careers and a firsthand look at what it takes to be a Fireman and Paramedic. Additionally, Starbucks offered professional development in personal branding and interview skills. There were many highlights of the day, but the best one by far was seeing the Orange County Sheriffs working alongside the students during the street clean up. Then they came back and helped us serve pizza (sponsored by Pizza Hut) to the kids! After lunch, the day ended with a PowerPoint presentation giving us a look back over the past four years of Trojan Service Day and a raffle giveaway where winners were awarded with a gift cards and gift baskets. The day could not have been possible without our sponsors, identified below.